ne hundred and fifty spears, ten canoes, three wives...trouble. Set centuries ago in tribal times, Ten Canoes is a surreal tragi-comedy. Dayindi (played by Jamie Gulpilil, son of the great David Gulpilil) covets one of the wives of his older brother. To teach him the proper way, he is told a story from the mythical past, a story of wrong love, kidnapping, sorcery, bungling mayhem and revenge gone wrong. In English storytelling (by David Gulpilil) and subtitled Ganalbingu language of the remote Arafura Swamp region of north-eastern Arnhem Land, this is a film unlike any you have ever seen. 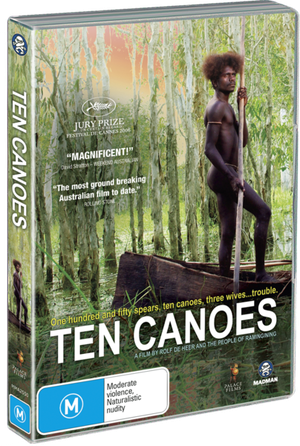 A parable of forbidden love, narrated by Australian icon David Gulpilil and starring his son Jamie as the covetous youth Dayindi, Ten Canoes is a ground-breaking glimpse into Aboriginal life centuries before European settlement.